When it comes to adding impact to ordinary cuts of meat, crusting is key. And panko makes things extra-crispy and even more delicious than traditional breadcrumbs. 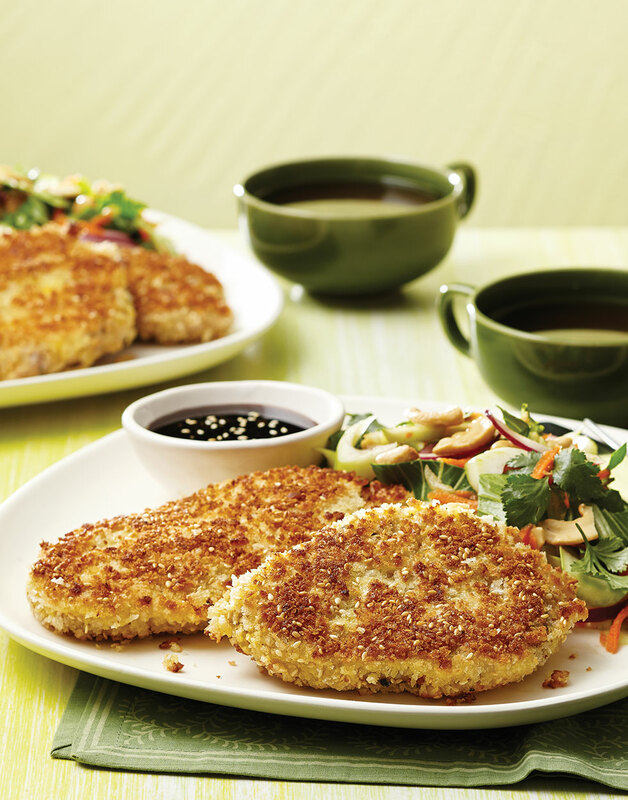 For phenomenal crunch and subtle Asian flavor, pair the panko with sesame seeds to bread the pork cutlets. Then take the cutlets over the top with a sweet, savory, and tangy caramel sauce. Popular throughout southeast Asia, fish sauce is a very pungent, strongly flavored liquid made from salted, fermented fish. It’s used as a condiment and flavoring, much as soy sauce is. Use fish sauce sparingly as, just like soy sauce, it’s quite salty. For the pork, pound pork pieces with a meat mallet to 1/2-inch thick; season with salt and pepper. Combine panko and sesame seeds in a shallow dish. Whisk together eggs in another shallow dish. Place flour in a third shallow dish. Dredge pork in flour, tapping off excess, then in egg, letting excess drip off, then in panko mixture, pressing to adhere. For the sauce, heat sugar in a skillet over medium until it’s the color of iced tea, 7–10 minutes. Combine vinegar, lemon juice, soy sauce, and fish sauce; carefully add to caramel, whisking until smooth. Add shallots, garlic, ginger, and serrano. Increase heat to medium-high; simmer sauce until thick and reduced by half, about 5 minutes. Strain sauce through a fine-mesh sieve; discard solids. Return sauce to skillet; keep warm over low heat. Heat oil in a sauté pan over medium-high until it shimmers. Sauté pork until golden brown on both sides and until a thermometer inserted into the centers registers 145°, 5–6 minutes total. Serve cutlets with sauce. Slowly add the vinegar mixture to the caramelized sugar, whisking until it’s fully incorporated. For the most accurate reading, insert the thermometer through the side of the cutlet into the center.